Saxlingham Nethergate is a moderate sized parish located some 7 miles south of Norwich, within the South Norfolk District. It lies north of Hempnall and south of Shotesham, both of which are larger parishes. The village itself along with the surrounding landscape are very attractive and have consequently been designated as a conservation area. The origins of the name Saxlingham Nethergate are not clear. Saxlingham means ‘homestead of Seaxel’s people’ in Old English with Nether meaning ‘lower’ and Gate referring to goats. Therefore it is possible that Seaxel’s people lived in a settlement at the bottom of the valley here and kept goats, if these translations are followed. Whatever the case, the parish has a long history and was certainly well established by the time of the Norman Conquest, its population, land ownership and productive resources being detailed in the Domesday Book of 1086. This document reveals that a certain Godric held many of the lands for the king, and that the lands themselves were of some note – with parts being valued at 30-40 shillings. The earliest find from the parish is that of a Palaeolithic flint handaxe (NHER 21753), found to the west of Woodhouse Farm. A collection of Neolithic flint tools (NHER 21802) has also been recovered from the same area and this has given rise to the suggestion the first farming in Saxlingham Nethergate took place here. Whether this is true or not is uncertain, but the discovery of Mesolithic (NHER 10096) and Neolithic axeheads (NHER 14857), flint blades (NHER 10098) and flakes (NHER 19310 and 21486) show that the landscape was populated from the very earliest of times. However, it is perhaps the Bronze Age period that is of most interest when considering the prehistory of Saxlingham Nethergate. Aerial photography has identified a large hengiform monument and a number of ring ditches to the northeast of St Mary’s Church (NHER 10124). The size of the ring ditches suggests they are early barrows, maybe part of a barrow cemetery, with the henge forming the central focus. Other Bronze Age ring ditches have been recorded to the east (NHER 17697), northwest (NHER 10111) and north-northeast (NHER 36352) of this hengiform monument, which certainly shows a heavy investment in the area during this period. It is not clear whether these barrows contained inhumations or were merely cenotaphs as only one has been dug (NHER 17697), and no human remains were found – only flints and pottery sherds. In addition to these important sites several contemporary artefacts have been recovered. This collection consists of, amongst others, a perforated stone macehead (NHER 10097) and two palstaves (NHER 35756 and 35786). No definite Iron Age sites have been found in the parish but metal detecting has helped to retrieve a few objects from this era, mainly coins of the Iceni tribe (NHER 30110 and 35000) and pottery sherds (NHER 22184). But as we move into the Roman period there is an upturn in the number of archaeological records. To the far north of the parish is the southern tip of the Shotesham Romano-British settlement (NHER 10099). This site has been extensively investigated from 1967-96 and traces of Roman buildings, water piping and numerous objects have been discovered. The density and diversity of finds here – including coins, tesserae, tiles, jewellery, dress fittings, metal working debris and pottery sherds – suggest a settlement was located here in the Romano-British period. Nor is this the only probable Romano-British settlement in the area. Investigations to the west of Hill House, south of the village, have recovered a large scatter of coins, pottery sherds and tiles (NHER 29778) that are felt to be characteristic of settlement. Roman finds not connected to these two sites tend to be mundane coins (NHER 10100) and pottery sherds (e.g. NHER 19309) although an interesting ox-head terminal from a mortar and a nice Dolphin brooch (both NHER 29682) have been recovered. It is possible that a Saxon cremation cemetery is situated somewhere within the parish. This is because a burial assemblage consisting of a Coptic bowl, four Early Saxon pots, a pair of tweezers and iron knives (NHER 20902) seen in an antiquities shop in Norwich had Saxlingham Nethergate listed as one possible origin. A cemetery such as this would certainly tally with the fact that the churches of St Mary in both Saxlingham Nethergate (NHER 10124) and Saxlingham Thorpe (NHER 10115) both trace their earliest origins back to this period. Together these two factors illustrate an investment in the area through building, burial and occupation during Saxon times. Metal detecting has unearthed a couple of pieces of Saxon metalwork, with the most noteworthy example taking the form of an unusual stirrup mount decorated in relief with three animal heads (NHER 35001). The medieval period saw elaboration of both the Saxon churches mentioned above. Much of St Mary’s Church in Saxlingham Nethergate (NHER 10124), including the grand tower with brick and flint battlements, dates to the 14th/15th centuries. Similarly, the tower and buttresses of the now ruinous St Mary’s in Saxlingham Thorpe (NHER 10115) date to around 1500. 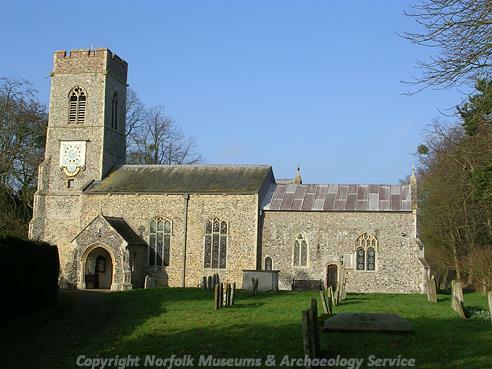 It is also worth noting that visitors can see some of the earliest stained glass windows in Norfolk in the south chancel of the surviving St Mary’s and the medieval font of the Thorpe church as part of a wall at Dairy Farm on The Green (NHER 22186)! Of course there is more to medieval architecture than churches, as the attractive stone bridge linking Saxlingham Nethergate and Newton Flotman built during medieval times shows. Aerial photography and documentary sources have helped investigate the presence of medieval manor houses in the parish. A number of moated enclosures, which are often indicative of manorial sites, have been identified in Old Hall meadow (NHER 10101), at the site of the later Old Hall on Church Hill (NHER 11917) and southwest of Home Farm Cottage (NHER 17737). 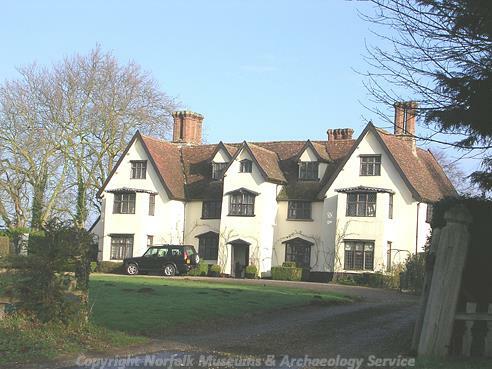 It is certainly possible that there were as many as three manor houses in Saxlingham Nethergate at this time. The same maps used to locate these manor houses also show the positions of a number of domestic dwellings (NHER 13174, 22188 and 22194). Sadly no physical remains survive although artefact scatters (particularly of pottery sherds) suggest that structures did once stand here. Aside from these buildings and sites we have a number of medieval artefacts on record. Highlights include a bronze belt mount with Lombardic lettering (NHER 33230), a ‘Jew’s Harp’ buckle (NHER 24602) and Flemish floor tiles (NHER 17049). However, the relative paucity of non-pottery finds from this era is noticeable compared to earlier periods. Saxlingham Nethergate has many fine post medieval buildings, many of which relate to the great rebuilding of properties during Elizabethan and Stuart times. A great number of these buildings are located along the length of The Street, including Beechview (NHER 19721), Yew Cottage (NHER 21313), Saxlingham House (NHER 21314) and the Old Carrier’s Arms (NHER 21312). This former public house is particularly interesting with the interior featuring many of the original 17th century heavy planked doors. Saxlingham Nethergate is also blessed with a decent selection of period cottages that may be of interest to visitors. These include the charming 16th century Hill Cottage (NHER 16528) which has ‘eye-browed’ windowing and Orchard Cottage (NHER 16530) which dates to the 17th century and is attached to an unusual timber-framed building built in a style not familiar to Norfolk. The most impressive buildings are to be found on Church Hill, namely Old Hall (NHER 11917) and the Old Rectory (NHER 16529). The 17th/18th century mansion at Old Hall is one of the oldest in England and sits inside an earlier medieval moated site. In addition to the fabulous interior décor it is most notable for the fact that it was used as a hospital in World War One. Sir John Soane designed the magnificent Georgian style Old Rectory in 1784. Notable features include the Doric porch and the beautiful pierced-rose roof cornice. Saxlingham Hall (NHER 48456), situated on the Green, also merits a mention in this discussion of high calibre buildings. The use of this building has changed over time with the 18th century brick built mansion now serving the community as a nursing home. The roundup of post medieval buildings in Saxlingham Nethergate finishes with a selection of those related to agriculture and industry. Three mills are recorded in the parish: Black Mill (NHER 10120), Saxlingham Mill (NHER 10122) and the mill whose base forms part of the third Mill Cottage (NHER 22199). Black Mill saw use by smugglers before being converted into a house in 1930 and demolished in 1958, whereas the present Saxlingham Mill was constructed in 1900 and used until 1991 to grind corn. Two brickworks are reported to have existed in the parish south of St Mary’s in Saxlingham Thorpe (NHER 11301) and to the northeast of Nookside on the Norwich Road (NHER 22187). However, it has been difficult to find any physical traces of the structures that once stood here. For a sense of completeness it should be mentioned that there are a number of post medieval finds from the parish. These comprise coins (NHER 10101 and 29682), buckles (NHER 13174), a slat spoon (NHER 24602) and numerous pottery sherds. Unfortunately, nothing of great interest has yet been found dating to this period. Currently, the most recent archaeological record available for Saxlingham Nethergate relates to the cast iron telephone booth (NHER 45705) located on Wash Lane. This type of booth, designed in 1935 and manufactured widely across Britain, is square-shaped with a domed roof. No records of World War One/World War Two monuments or finds exist, although this does not necessarily mean that no defences were erected in the parish. Perhaps further archaeological investigation is needed to find them. Thomas Sunley (NLA), 30 January 2007.